Rhyncholaelia glauca never seems to get as much attention as its comically hirsute cousin, Rhyncholaelia digbyana. And that's a shame. The flower appears to have been sculpted out of ivory. The leaves are a dusty blue-grey (glaucous is the botanical term for this, hence the name). It's so elegant. I experience one of those fall-in-love moments every time I see it. Both species were formerly included in Brassavola. As Brassavolas they appear in the ancestry of lots of Blc. (Brassolaeliocattleya) hybrids. 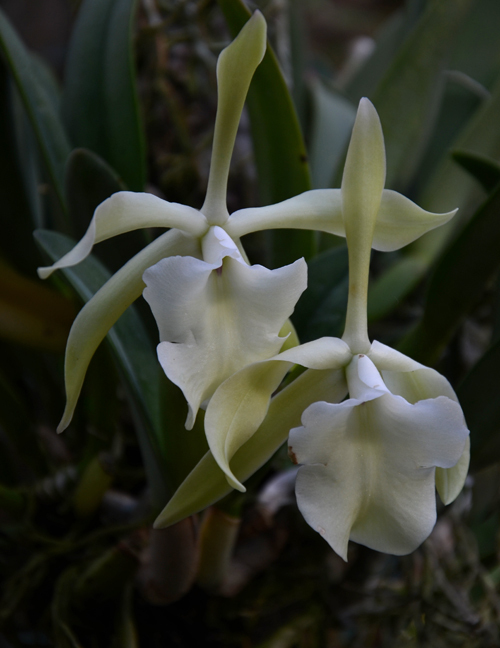 Rhyncholaelia glauca grows as an epiphyte or lithophyte in seasonally dry forests from Mexico to Colombia at 600 to 1600 m. (You can do a rough conversion from meters to feet by multiplying by 3.) This elevational range indicates that it likes warm (64º night min.) to intermediate (58º night minimum) temperatures. Our plants do just fine in a warm greenhouse. Light Very bright with some sun. Watering After it flowers water less frequently until the new shoot appears. Potting Mix The classic trio of fir bark+charcoal+perlite. Also does well in the greenhouse mounted on a branch.